For the third edition of "Krug en Capitale", prestigious Champagne house Krug has invited Formavision to stage a series of fourteen dinners pairing an unexpected Parisian location, an awarded chef, a designer and musician. Formavision partnered with thrice three-star Alain Ducasse chef, rare-instrument musician Loup Barrow, the mythical Plaza Athénée while closed for a full renovation and sound sculptor Sebastien Leon to craft a memorable experience. The evening started with a performance of Cristal Baschet and steel guitar, taking guests to a musical journey in vast American desert landscapes, while observing the sun set on the Eiffel Tower. The happy few were then taken to a dining room imagined by Sebastien Leon with seating and tables designed specially for the occasion. The dinner, entirely composed by Alain Ducasse, underscored at every stage the rich notes of carefully picked Krug Champagnes. To conclude the evening, guests were invited to the rooftop of the hotel where they discovered the Carileon, a sound sculpture operating on two levels; while the wind swang the tubes against the balls and played clear sounds, the tubes were also played with felt mallets by Loup Barrow creating soft melodies. These two musical dimensions allowed to hear a seamless melody played in part by the wind, and in part by the musician. 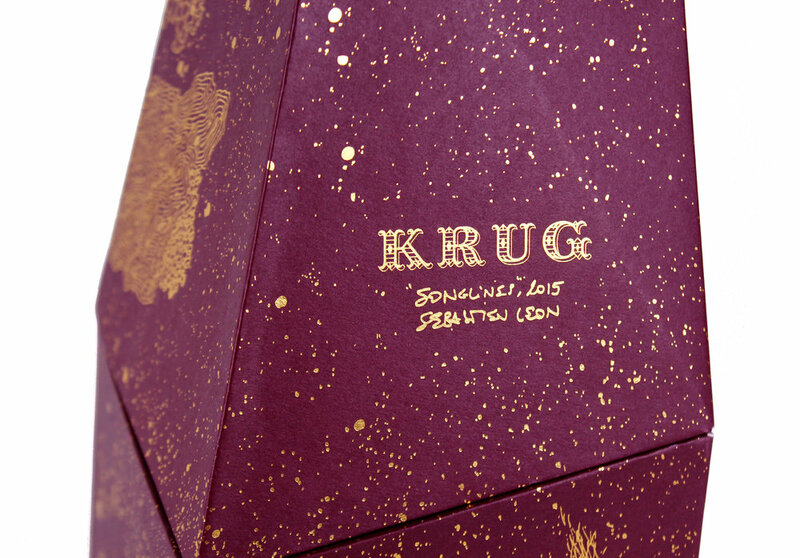 Following the success of Krug En Capitale, Formavision's founder was commissioned to design the holiday special-edition Krug packaging, and to stage a window campaign to present the collaboration in selected establishments worldwide.